David Edward Burke aka, “The Logical Liberal,” has had a lifelong interest in politics since his days on the high school “Constitution Team.” He worked as a Congressional staffer and campaign coordinator before launching Citizens Take Action, a nonprofit organization that is focused on fundamental political reforms like getting big money out of politics. He is the author of a constitutional amendment proposal to accomplish that goal called the Restore Democracy Amendment. 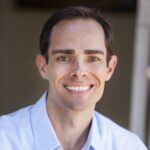 Prior to founding Citizens Take Action, David earned a BA in Political Science from UCLA in 2004 and graduated from UCLA School of Law in 2009. He subsequently clerked for two Superior Court judges, worked as an animal rights attorney, created the world’s first major Vegan Oktoberfest event (which The Onion made fun of), and taught LSAT classes. While explaining logical fallacies to aspiring attorneys, David began to see just how often our nation’s leaders use flawed logic to seduce the electorate. Born with an exceptionally low tolerance for BS, David is quick to point out deception, hypocrisy, or suspect arguments regardless of their source. David’s writing has gained widespread attention with controversial takes like “Donald Trump is the President We Deserve” and by suggesting that America’s most beloved citizen, Oprah Winfrey, should not run for President. He has appeared as a speaker at the National Citizen Leadership Conference and the Unrig The System Summit, and is the host of the Citizens Take Action podcast.